My husband had never been to Nantucket, and I had only been once, so we booked a spring weekend in early May to visit this island located 31 miles off Cape Cod. 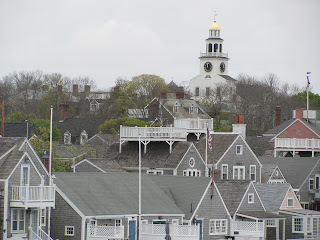 We drove the 75 minutes from Boston to Hyannis and bought two round-trip tickets for the 11am fast ferry (one hour) at a cost of $67 per person. We chose the Steamship Authority over Hy-Line Cruises as the price was slightly less expensive and the 11am departure time was more convenient. 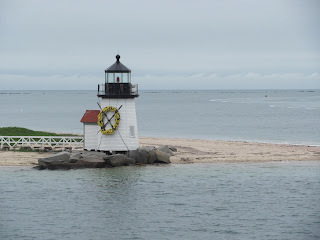 Arriving in Nantucket, we passed the Brant Point Lighthouse before pulling up to the dock. 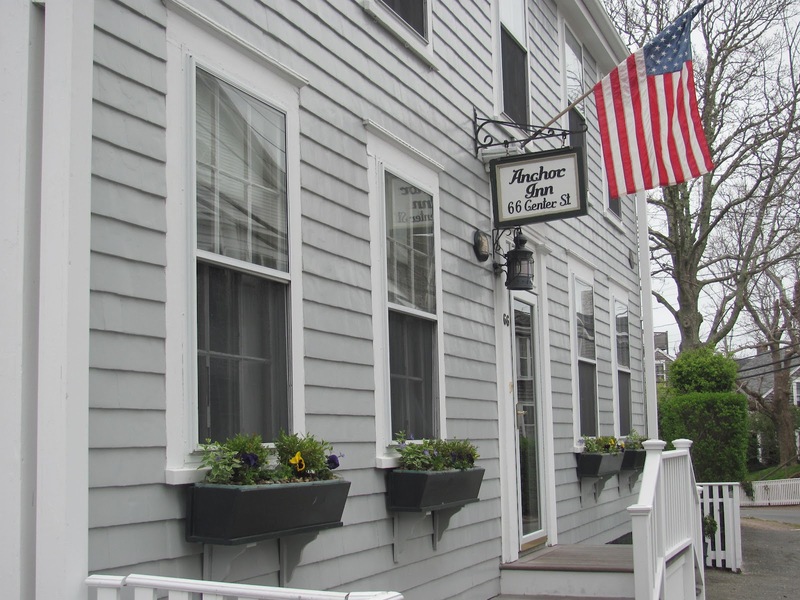 The sky was cloudy but not raining (as forecasted) so we left the ship and walked up the street toward the quaint Anchor Inn on Centre Street, an easy eight-minute walk from the boat. 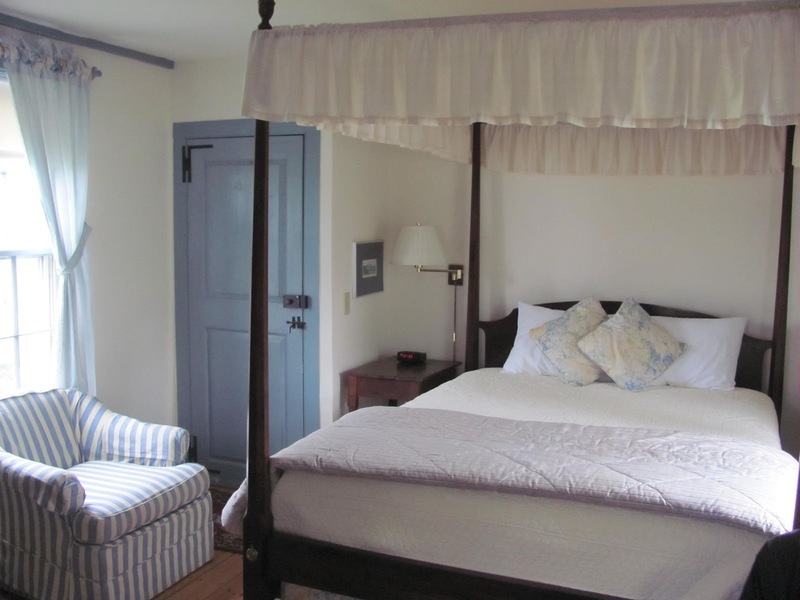 At the inn, a friendly staffer cheerfully greeted us, gave us a brief tour and showed us to our room for the weekend. It was only noon, but our room was ready and Heather let us check in early, which was fantastic. We stayed in the cozy Tucker room, which we liked because of its privacy. It had its own private staircase and a small balcony/sitting area with two plastic chairs, nothing fancy but so nice to sit outdoors. The room was bright, clean and nicely decorated and we appreciated the greenery outside of the windows. The bed was very comfortable and the bathroom had a tub (not just a shower). Most importantly, our room was very quiet; we didn't hear other guests. Hungry, we walked to find the Rope Walk Restaurant, at the recommendation of my husband’s coworker, who suggested we pop in for a lobster roll. 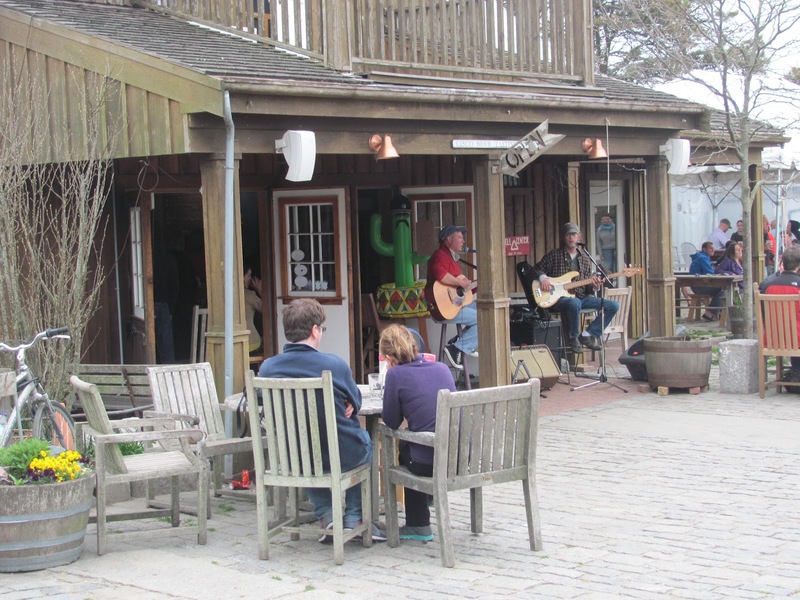 The Rope Walk Restaurant, like most of Nantucket in early May as locals prepare for the summer season, was closed and under construction. After circling the cobblestone downtown area for an open restaurant, we stumbled upon the Brotherhood of Thieves on Broad Street. We grabbed two seats at the bar and ordered lunch. Two chowders, a lobster roll, a crab burger and four Cisco Whale's Tale Pale Ales ($7.50 each!) brought our lunch bill to at the surprisingly high cost of $80. 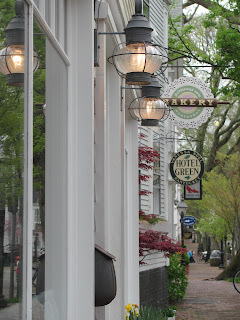 However, service was great and the chowder was AMAZING, as was the lobster roll. The crab burger was just ok and almost impossible to eat, falling apart in our hands. After lunch, we walked around the pier and peeked into the shops downtown before taking a stroll to the White Elephant to check out the property. Later, we settled in for a much-needed nap at the inn, but not before making 7:30pm reservations at Dune, a restaurant on Broad Street. Warm Fig, Bread & Butter Pudding for dessert. 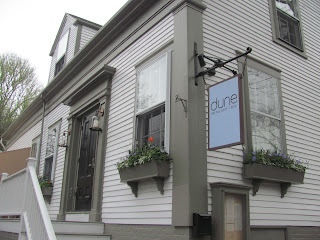 Our dining experience at Dune was the highlight of our weekend – don’t miss it! After dinner, we had a drink at The Rose and Crown on South Water Street and watched the Celtics games. At 10pm, a DJ started playing tunes, more folks piled in and the dance floor got busy. 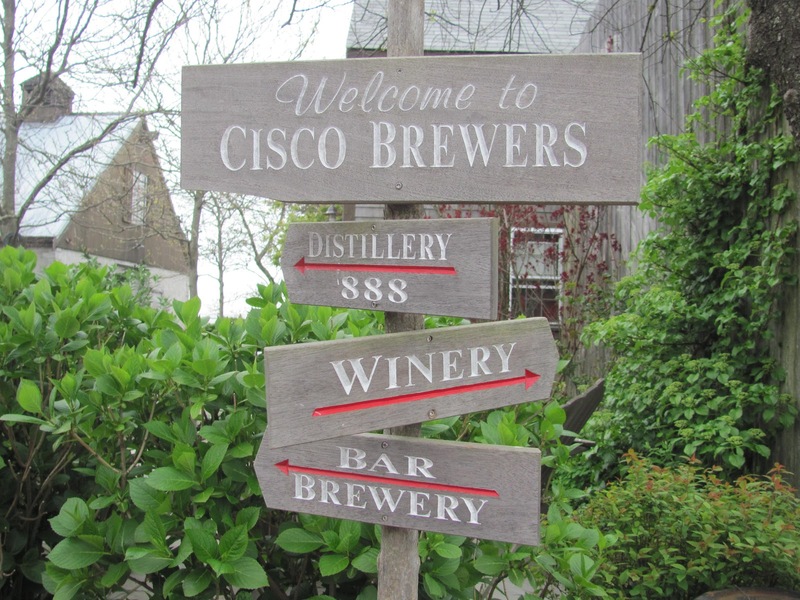 A fun place! After breakfast (juice, coffee, tea, fresh fruit and warm muffins) in the Anchor Inn’s lovely breakfast room, we grabbed our windbreakers and headed to Affordable Rentals on South Beach Street. The man at the desk was super friendly and rented us a two-door Jeep Wrangler for $99 for 24 hours. 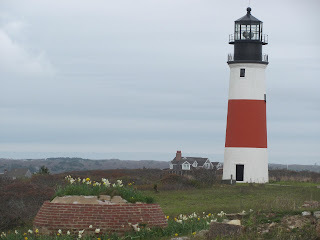 After a quick stop at the gas station, we headed out to Siaconset, stopping at Sankaty Head to photograph the lighthouse and explore a bit. 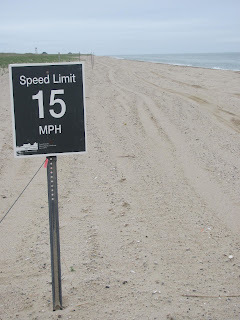 After that, we drove to Wauwinet to visit the Coatue Wildlife Refuge, home of Great Point Beach and the Great Point Lighthouse. 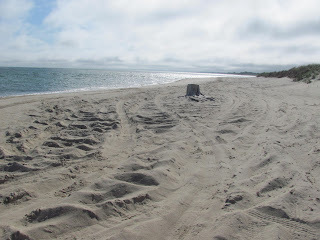 In our jeep, we drove for miles right on the beach – so beautiful and full of wildlife! We saw seals, shorebirds, seagulls nesting in the dunes; the colors of the coastal plants were amazing. A sunny day would have made the scenery more breathtaking but even with clouds, we enjoyed the remoteness and beauty of the nature surrounding us. 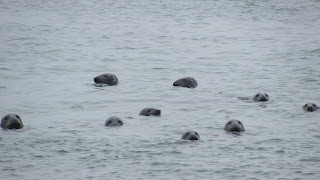 We also saw a colony of grey seals – there must have been 200 of them – frolicking in a protected area. As we walked back to toward our jeep, 10 or 15 of the seals swam along with us; we figured they were protecting the others or just curious. 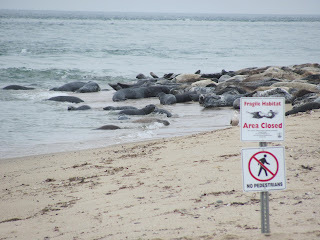 Click here to see a video of the seals (I was not near the seals, just have a decent zoom). Back in the jeep, it was 2pm and we were starving! We headed back to town to find some lunch. I heard from another traveler that Stubby’s near the pier has great Jamaican dishes and we were not disappointed! Jason ordered the jerk chicken and I ordered the chicken curry. Served with rice and beans and washed down with Gatorade (Red Stripe would have been better but no alcohol at Stubby’s), this was a perfect lunch! Don’t forget to try an oatmeal or chocolate chip cookie – yum! 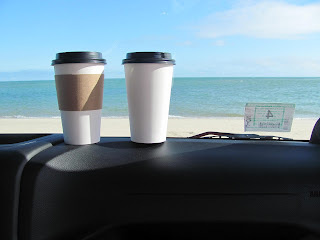 Back in the jeep, we headed toward Bartlett’s Farm, stopping to check out Cisco Beach. I had read about bluegrass at the Cisco Brewery at 4pm, so we parked to check it out and have a beer. 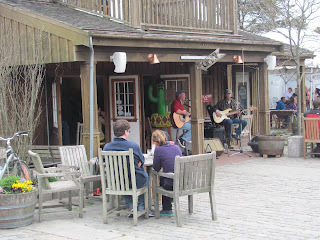 What an awesome place this must be in the summer with its outdoor seating and fun atmosphere! We each ordered a Whale’s Tale Pale Ale and a Bailey’s Blonde Ale, grabbed two chairs and listened to the two-man band play a few tunes. After a nap, we walked to Fifty-Six Union in time for our 8pm reservation. After a martini each at the bar, we moved to a table and ordered dinner. We split the soup of the day (a sweet potato/ginger soup, I believe) and a wedge salad (usually our favorite) but we did not care for the dressing. We both wanted the seared Nantucket Bay scallops but the restaurant was out of them. We ordered the Osso Bucco, which was filling and tasty, as well as a strawberry/blueberry shortcake dessert. Our server was cold to us; we were pretty disappointed with this restaurant compared to our fabulous experience at Dune – especially considering Fifty-Six Union was more expensive! 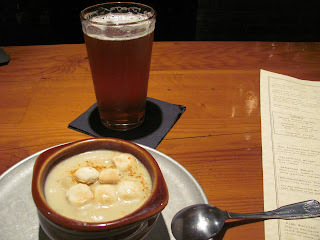 After a walk along the pier, we stopped into the Brotherhood of Thieves for a beer, and then headed to bed. We woke up early, grabbed coffee and pastries at Island Coffee near the wharf (the Morning Glory muffin is fabulous – carrots, raisins, healthy!) and headed out in the beautiful sunshine (yay!) to explore more of the island. 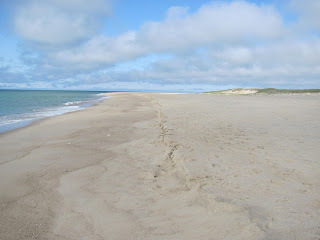 First stop, Dionis Beach which was absolutely spectacular! I loved the fence adorned with conch shells and even added a shell that I found on the beach. 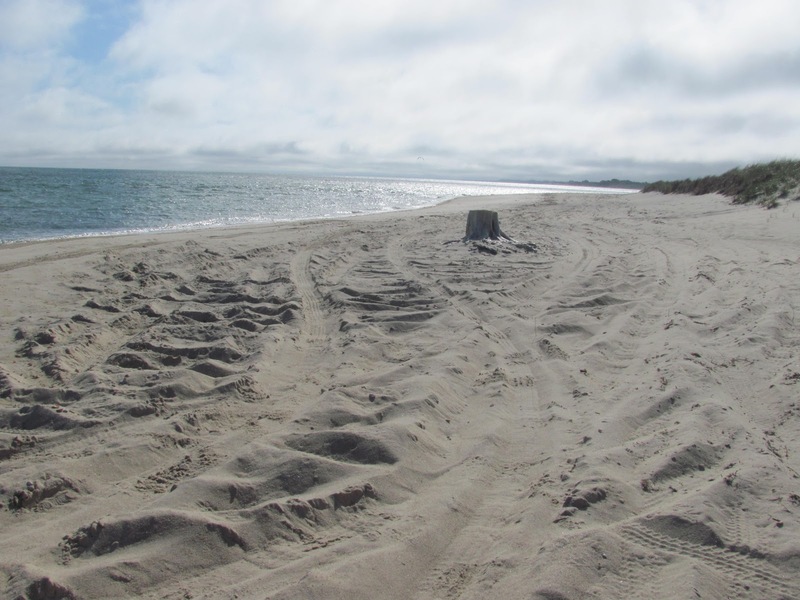 Next, we followed an unpaved road lined with fabulous homes to Eel Point, where we were able to drive right on the beach again, for miles. Wow, this was fantastic! We parked, with the sun warming us, and ate our breakfast in the jeep overlooking the water, just spectacular. Our last stop was at Surfside Beach, which was amazing. 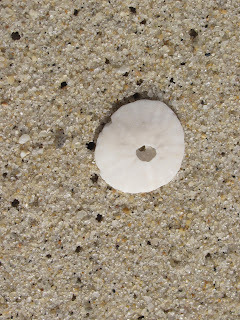 We took a long walk on the wide beach, and found several sand dollars and all sorts of treasures along the way. We saw a young seal on the beach and I felt sad, thinking it was sick or on death’s door. 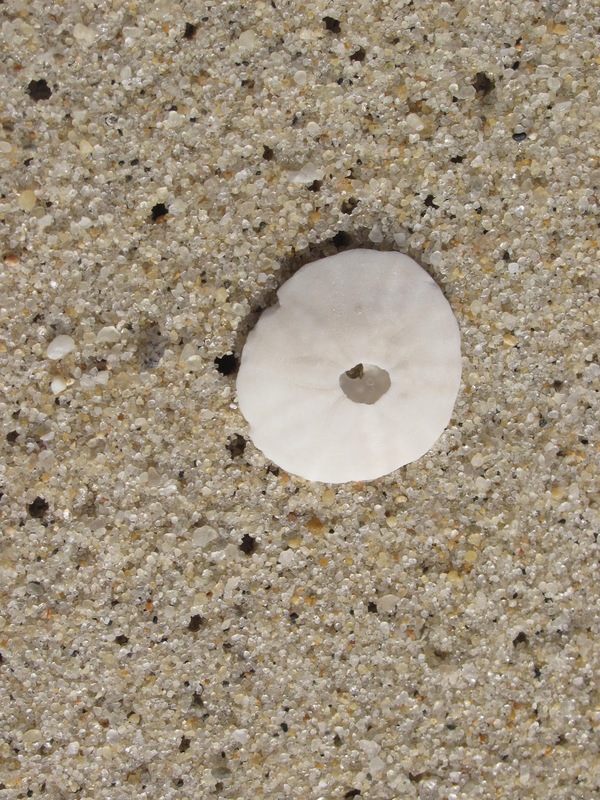 A woman on the beach told us it was molting, or shedding its skin and would probably be ok eventually. 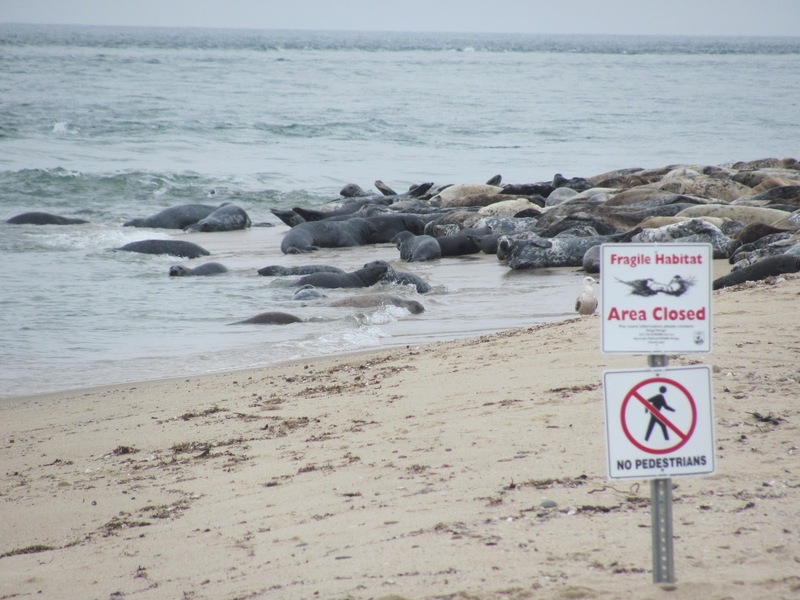 She also told us how important it is to stay 150 feet away from all seals, because they can bite, which we didn’t know. 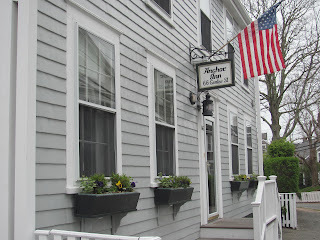 After returning the jeep, we said our goodbyes to the innkeepers at the Anchor Inn, and read our books on benches in town in the sun until boarding our 12:30pm ferry. After an easy ride back to Hyannis, we hopped on the shuttle bus back to our car and paid the whopping $36 parking fee for just over 48 hours of parking. As expensive as it was, we enjoyed our trip to Nantucket and would like to visit in warmer weather and enjoy this island’s unspoiled and serene beaches. To learn more about Nantucket, click here. 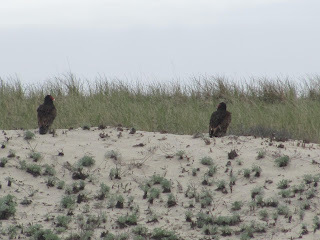 Afterthought - we saw these two birds perched on a sand dune - anyone know what they are? Hawks? Love Nantucket! Can't wait to try Dune. Great photos! Did you get a chance to check out the Sankaty Head Lighthouse? 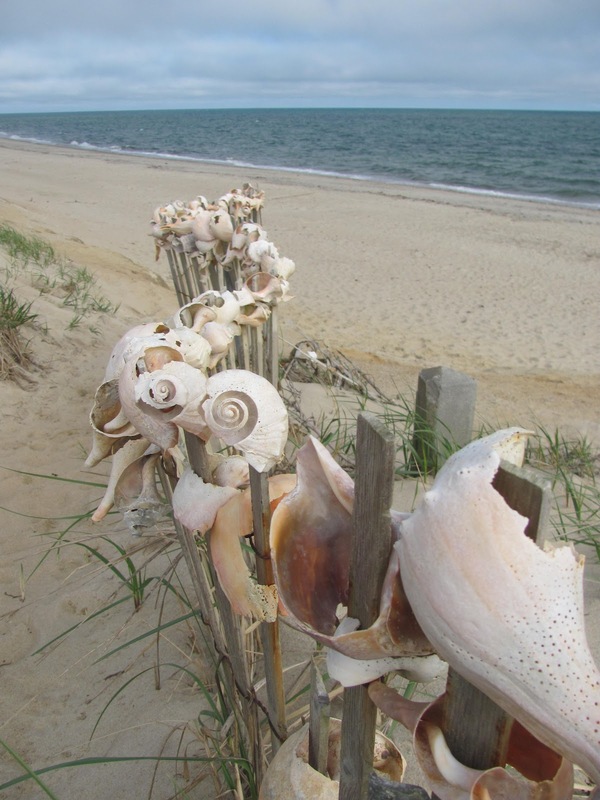 My husband and I rent out a beautiful Nantucket Summer Rental every year just a few minutes from there. Out of all the sights on the island that might be my favorite!